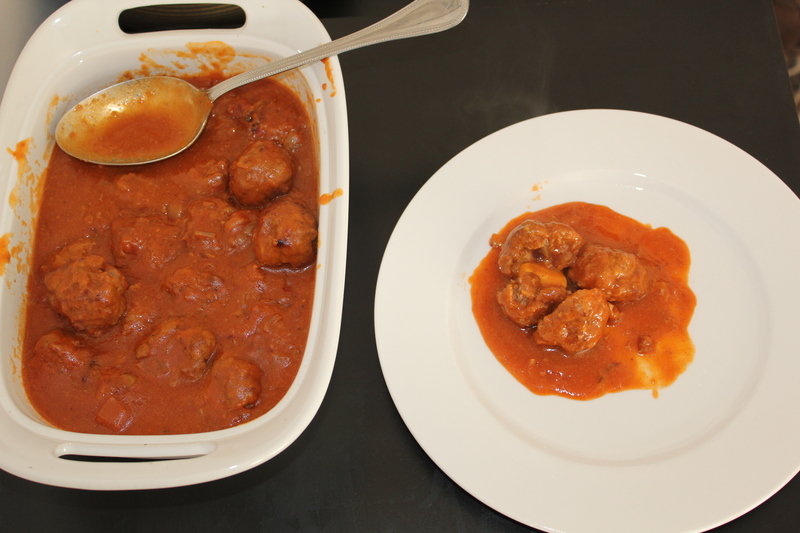 Mum’s been bringing these Cheese Meatballs to our house for all sorts of events for years. They are especially loved by my daughter, who on Mother’s Day this year made this batch for us. They were great, just like her Nana’s. To make the meatballs: Place the mince, breadcrumbs, egg, pepper and salt into a bowl and mix to combine. Press ¼ cup of the mixture into a patty. Place a cube of cheese into the middle of each patty and fold over the mince to enclose. Heat a little oil in a frying pan over a medium heat and cook the meatballs for 3 minutes on each side or until browned. Place the meatballs in a baking dish. Pour sauce over and bake at 180ºC for 30 minutes. To make the sauce: Blend tomatoes, add other ingredients. Serves 4 – but can easily be doubled or tripled if you have a big crowd to feed. This entry was posted in All Recipes, Beef, Main Dishes and tagged 1980s, cheese, meatballs by bebsrecipes. Bookmark the permalink.